Aim – Quality improvement training programmes and frameworks to enable frontline generalist care providers to deliver a ‘gold standard’ of care for all people nearing the end of life. 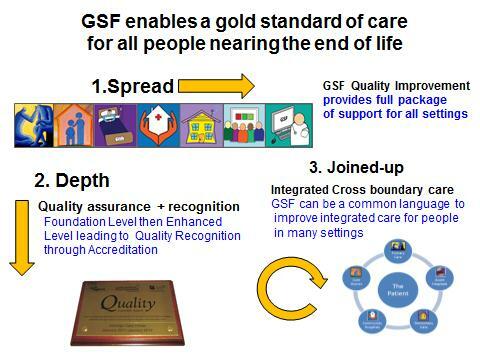 The National Gold Standards Framework Centre offers well validated quality improvement training programmes in End of Life Care for use in many settings. The training programmes enable generalist frontline staff in health and social care to provide a ‘gold standard’ of care for all people nearing the end of life. The key is enablement – GSF focuses on supporting the learning of new knowledge, skills and changing attitudes within teams through a practical interactive process leading to creative transformation. "This is less about what you know but more about what you do". They are comprehensive, practical and made specifically relevant to each setting, to ensure they successfully support all generalist frontline staff in this area. They have been shown to improve the levels of confidence of staff, their knowledge skills and attitude, and to make significant differences to care for people nearing the end of life. The programmes include evaluation and self-assessment to enable effective change and means to sustain good practice long term. They are well audit validated in each sector, for example GSF Centre has been awarded Excellence by the National Skills Academy. Several programmes now lead to Accreditation and the presentation of the GSF Quality hallmark Award. The GSF Training Programme: What do the sessions cover? There are 3 learning outcomes for each session, linked to the Quality Markers, with practical illustrations and exercises to help self reflection and action planning.